The field of psychology is very different than it used to be. Nowadays, the American Psychological Association has a code of conduct for experiments that ensures a subject’s confidentiality, consent and general mental well being. In the old days, it wasn't the case. Back then, you could, for instance, con subjects into thinking that they were electrocuting a man to death, as they did in the infamous 1961 Milgram experiment, which left people traumatized and humbled in the knowledge that deep down they are little more than weak-willed puppets in the face of authority. You could also try to turn a group of unsuspecting orphans into stutterers by methodically undermining their self-esteem as the folks who ran the aptly named Monster Study of 1939 tried to do. But, if you really want to get into the swamp of moral dubiousness, look no further than the Little Albert experiments, which traumatized a baby into hating dogs, Santa Claus and all things fuzzy. In 1920, Johns Hopkins professor John B. Watson was fascinated with Ivan Pavlov’s research on conditioned stimulus. Pavlov famously rang a bell every time he fed his dogs. At first the food caused the dogs to salivate, but after a spell of pairing the bell with dinner, the dogs would eventually salivate at just the sound of the bell. That’s called a conditioned response. Watson wanted to see if he could create a conditioned response in a baby. Enter 9-month old Albert B., AKA Little Albert. At the beginning of the experiment, Albert was presented with a white rat, a dog, a white rabbit, and a mask of Santa Claus among other things. The lad was unafraid of everything and was, in fact, really taken with the rat. 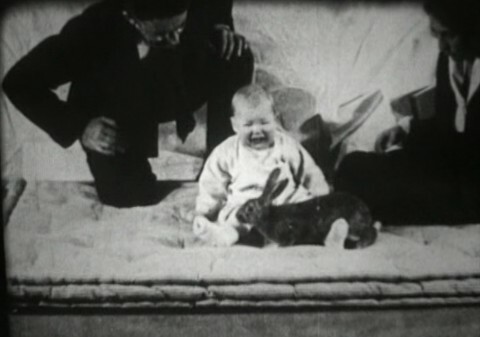 Then every time the baby touched the animals, scientists struck a metal bar behind him, creating a startlingly loud bang. 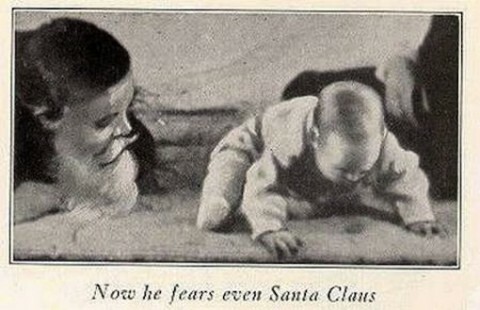 The sound freaked out the child and soon, like Pavlov’s dogs, Little Albert grew terrified of the rat and the mask of Santa and even a fur coat. The particularly messed up thing about the experiment was that Watson didn’t even both to reverse the psychological trauma he inflicted. What happened to poor baby Albert is hard to say, in part because no one is really sure of the child’s true identity. He might have been Douglas Merritte, as psychologists Hall P. Beck and Sharman Levinson argued in 2009. If that’s the case, then the child died at the age of 6 in 1925 of hydrocephalus. Or he might have been William Albert Barger, as Russ Powell and Nancy Digdon argued in 2012. He passed away in 2007 at the age of 87. He reportedly had a lifelong aversion to dogs, though it cannot be determined if it was a lasting effect of the experiment. Later in life, Watson left academics for advertising. You can watch a video of the experiment above. Mmh, the Milgram experiment didn’t quite have the effects you described. The participants have always been kept anonymous, so we know little of the enduring influence on them. Of course, participating in the experiment was unpleasant and stressful, as the debriefing after the experiment clearly showed. But certainly we do not know whether people really felt and thought about themselves what you described. Whatever it was, it is rather likely that a fair amount of those who participated actually came out stronger and more mindful of the consequences of their actions than if they would never have participated. As far as I know, only 1 person ever tried to contact people who had participated in Milgram’s experiments: Lauren Slater, who describes it in a chapter of the book “Opening Skinner’s Box”. Worth reading. Very interesting indeed. The same technique can be spotted nowadays, in wide array of human activities. Mr Skinner, and others, must be clapping their hands in their graves. Watson tried to reverse the conditioning of Little Albert, but before he had a chance to, the mother took the kid and stormed off, depriving him of restoring him to his original state. Older editions of psychology books failed to include this update to the study. I think it is so cruel the way they have done experiments and or used animals for their sick little games. It should NEVER be allowed or done period. Then to brain wash the kid to be afraid of those things is also sick and disgusting I don’t care if it’s in the name of science, NO! It’s never okay.